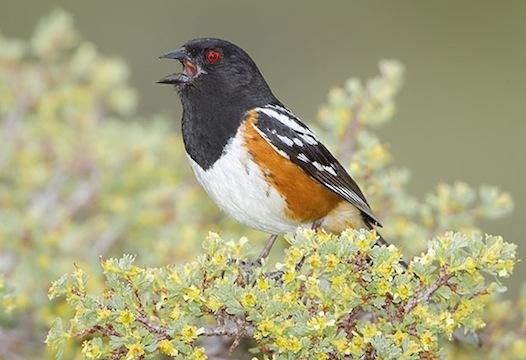 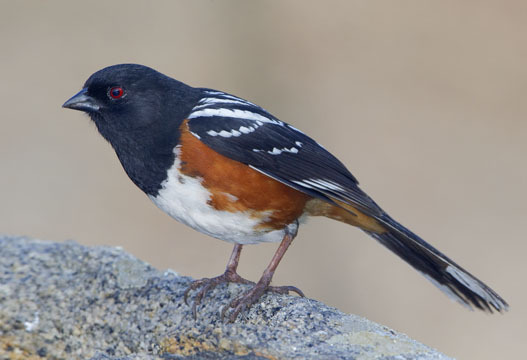 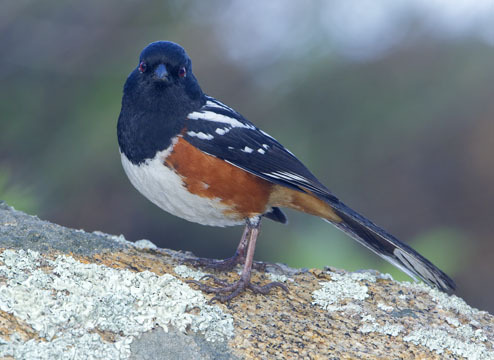 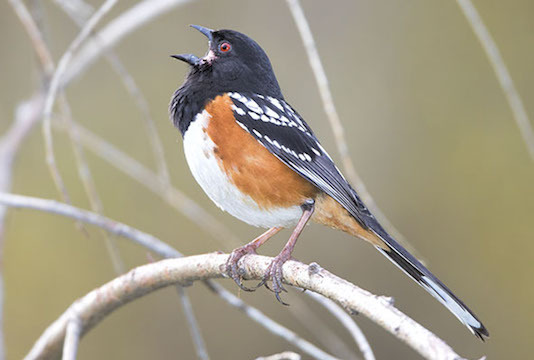 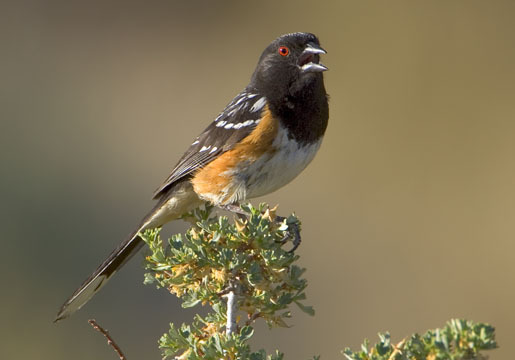 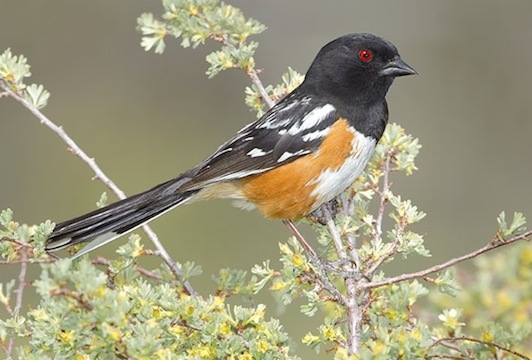 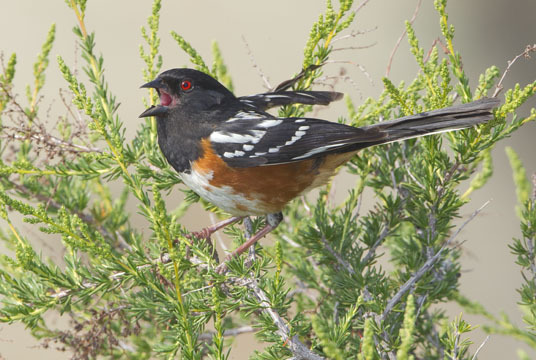 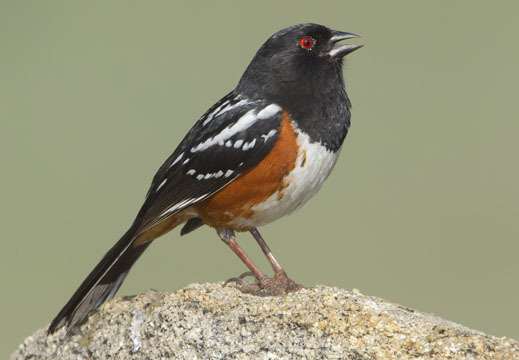 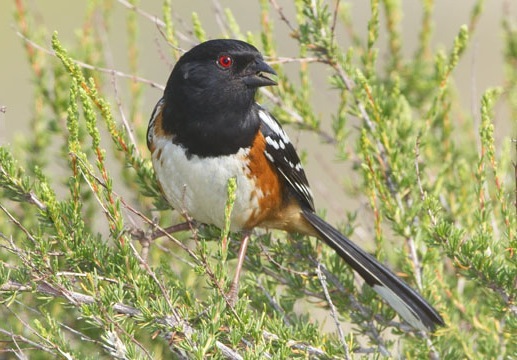 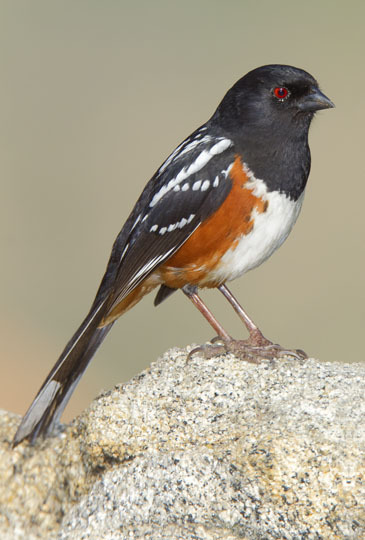 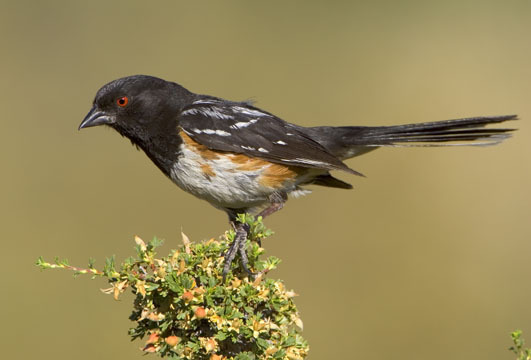 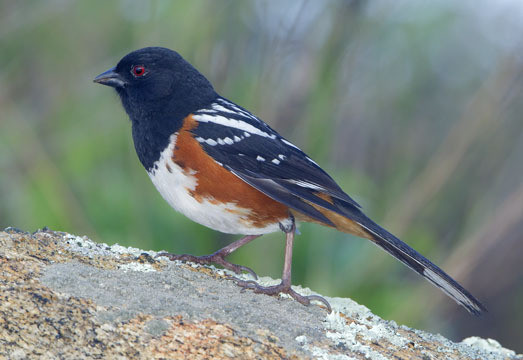 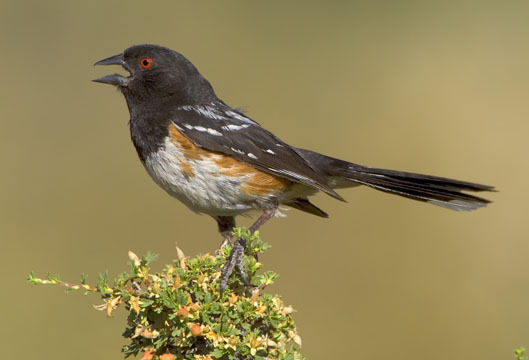 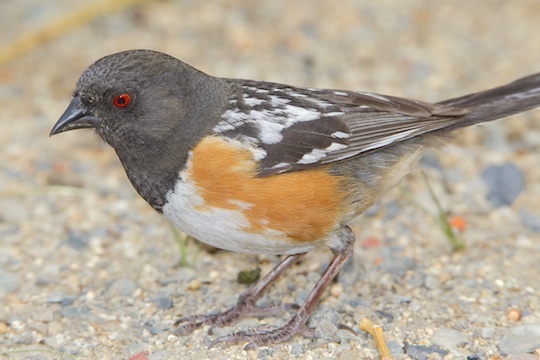 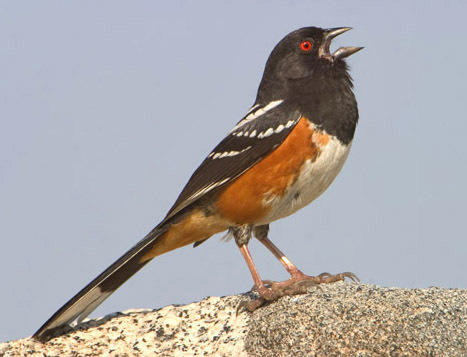 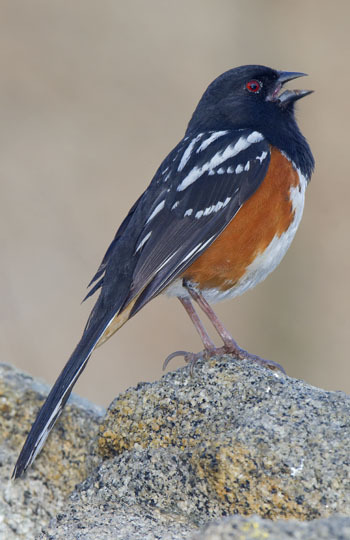 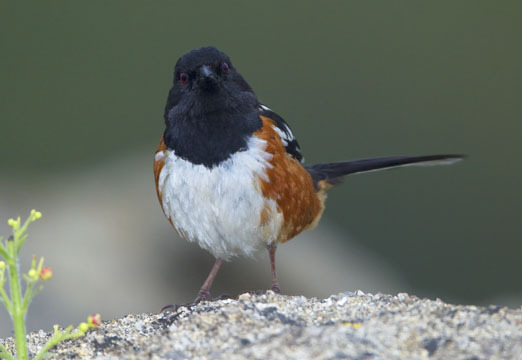 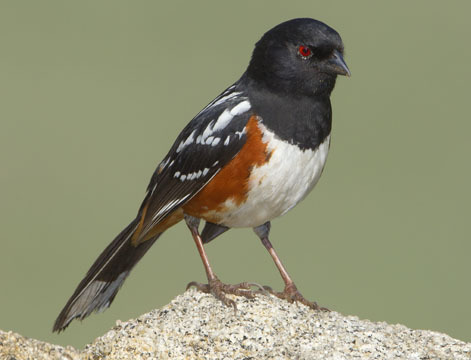 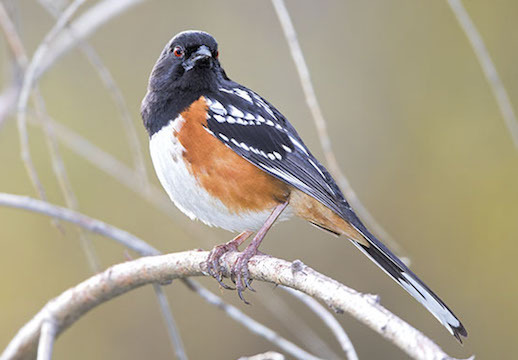 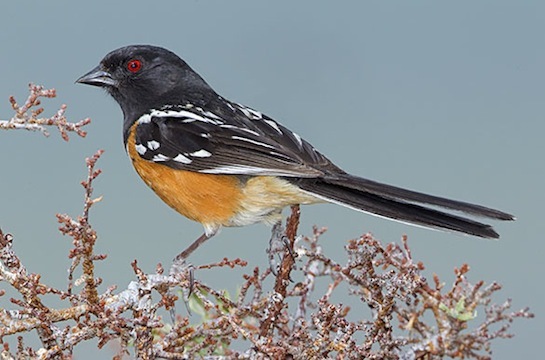 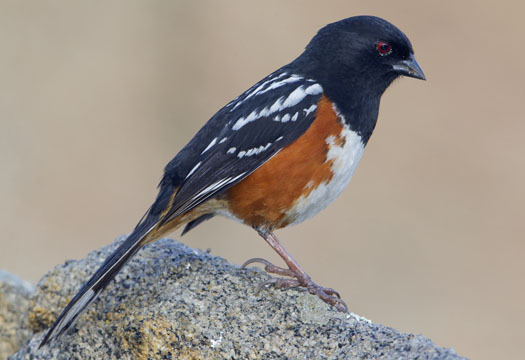 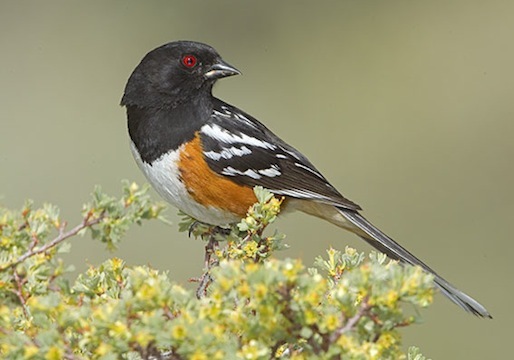 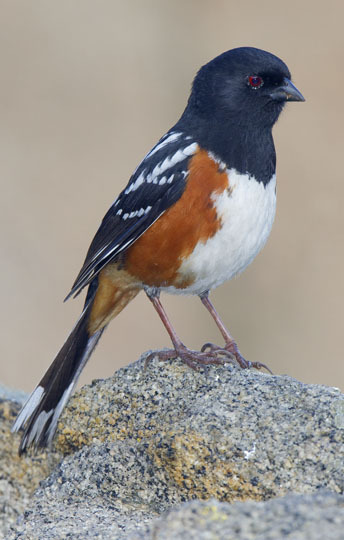 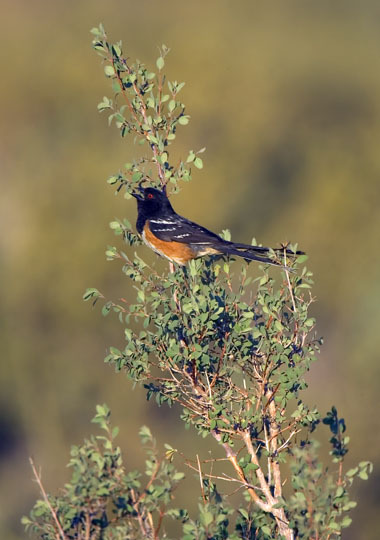 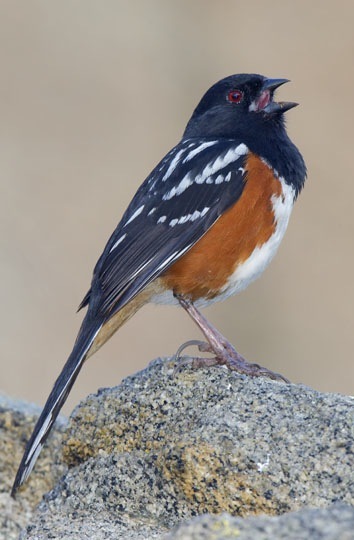 Spotted towhees are large, colorful birds that are often hard to see because of their skulking habits, but in spring the males (like most of these birds) may become much more bold, emerging to sing their territorial songs. 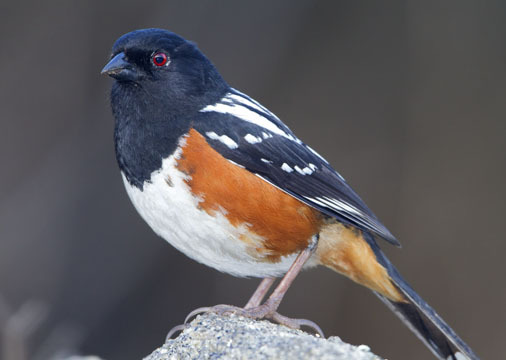 They usually spend most of their time in thick cover, often on the ground (notice the large feet, used for digging in leaf litter). 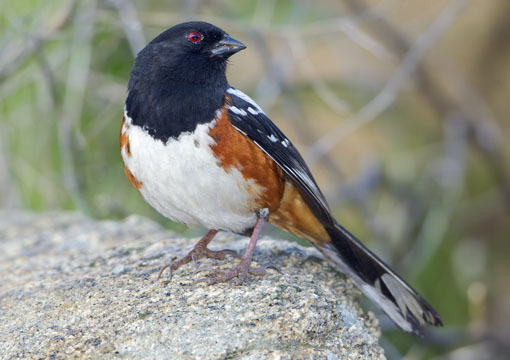 Spotted towhees were formerly considered a race of the eastern, or rufous-sided towhee, but they are now thought to be a distinct species. 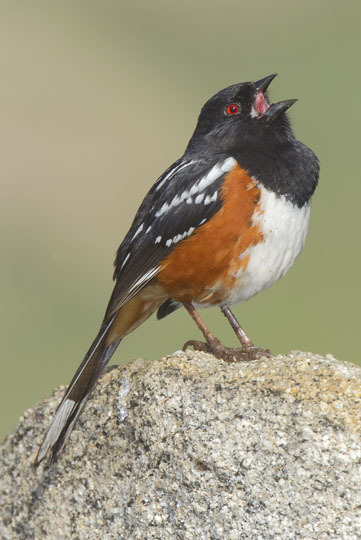 Females are somewhat less striking, with dark brown replacing the glossy black of the male's head and neck. 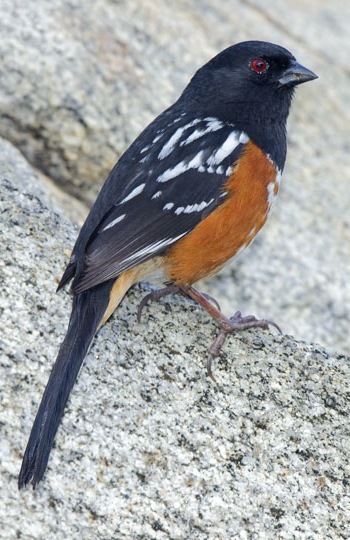 Most of these birds were in the Box Springs mountains near Riverside, California. 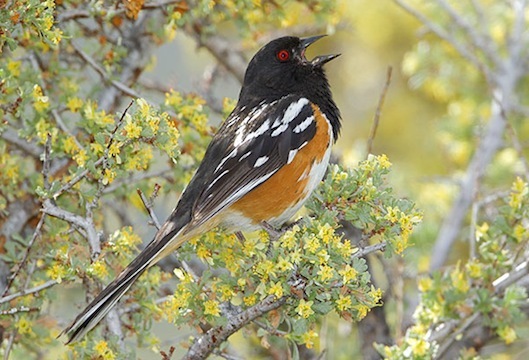 One was photographed in the University of California's Motte Rimrock Reserve, near Perris, California, and others -- including the somewhat scruffy bird photographed in the middle of the chick-rearing season -- were singing in sage-bitterbrush scrub in Mono County, California. 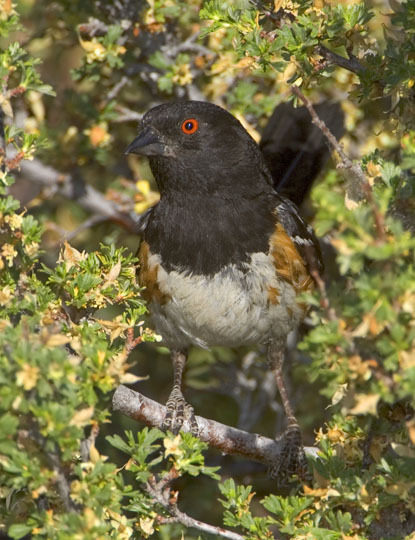 The female at the bottom of the page was photographed in Crowley Lake, also in Mono County.